architecture, and became independent. Greek painters used home made pigments, individual to each artist. The recipes were guarded closely and handed down generation to generation. Most home-made pigments were created from bone, charcoal, ground stone, and naturally occurring earth pigments. Eminent art historian and author, F. B. Tarbell explains "In the fourth century art became even more cosmopolitan than before. The distinctions between local schools were nearly effaced and the question of an artist's birthplace or residence ceases to have much importance Athens, however, maintained her artistic preeminence through the first half or more of the century. 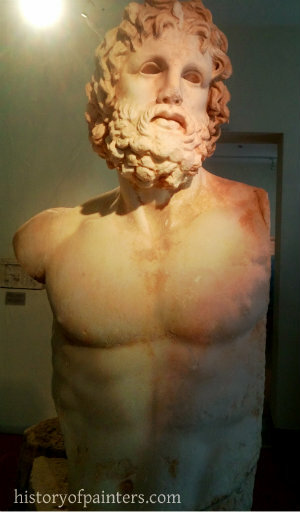 Several of the most eminent sculptors of the period were certainly or probably Athenians, and others appear to have made Athens their home for a longer or shorter time. It is therefore common to speak of a "younger Attic school," whose members would include most of the notable sculptors of this period. What the tendencies of the times were will best be seen by studying the most eminent representatives of this group or school." According to art historian, Walter Pater, "The supreme Hellenic culture is a sharp edge of light across this gloom. The fiery, stupefying wine becomes in a happier climate clear and exhilarating. The Dorian worship of Apollo, rational, chastened, debonair, with his unbroken daylight, always opposed to the sad Chthonian divinities, is the aspiring element, by force and spring of which Greek religion sublimes itself. Out of Greek religion, under happy conditions, arises Greek art, to minister to human culture. It was the privilege of Greek religion to be able to transform itself into an artistic ideal." 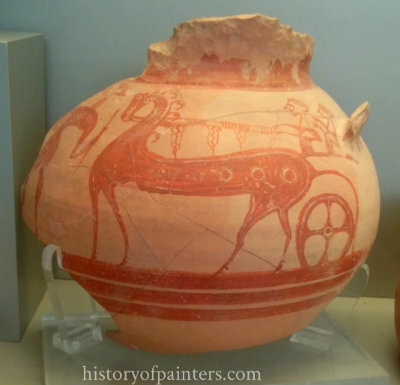 In early days, there was skill in the ornamentation of vases and in mural painting. Yet, with much spirit and feeling, there was a conventional treatment. The earliest artist of whom we know much is Polygnotus, about 420 B.C., whose groups of profile figures were described as remarkable for their life-like character and fine coloring. Apollodorus of Athens was distinguished, but Zeuxis of Heraclea is said to have been the first to paint movable pictures. He is famed for his marvelous power of imitation: the birds pecked at a bunch of grapes which he painted. But even he was outdone by Parrhasius. Zeuxis, however, had far higher qualities than those of a literal copyist. The most successful of the Greek painters was Apelles. Among his masterpieces was a painting of Venus rising from the waves, and a portrait of Alexander the Great. We have not in painting, as in sculpture, a store of monuments of Greek art; but the skill of the Greeks in painting fell behind their unequaled genius in molding the human form in bronze and marble. Greek historian, F. B. Tarbell explains "The art of painting was in as high esteem in Greece as the art of sculpture and, if we may believe the testimony of Greek and Roman writers, achieved results as important and admirable. But the works of the great Greek painters have utterly perished, and imagination, though guided by ancient descriptions and by such painted designs as have come down to us, can restore them but dimly and doubtfully. The subject may therefore here be dismissed with comparative brevity." and joyous spirit from the stiff and conventional styles of Egyptian and Oriental art. In the room of the somber, massive edifices of Egypt, they combined symmetry and beauty with grandeur in the temples which they erected. The temples were originally colored within and without. Three styles were developed, the Doric, the Ionic, and the Corinthian. In the Doric, the column and entablature have the most solid and simple form. The column has no other base than the common platform on which the pillars rest, and the capital that surmounts it is a plain slab. Greek artists created their masterpieces using homemade pigments. Pigments were made according to ancient recipes. Artists used many different ingredients to achieve the desired colors, including burnt apple seeds, pulverized semiprecious stones such as lapis lazuli, charcoal, animal and human bones, naturally occurring earth pigments such celadonite and chlorite, pomegranate juice and ground up ibulio beetles. Each artist mixing up his own a batch to use as needed. F. B. Tarbell declares"Two artists of the highest distinction now appear upon the scene. They are Zeuxis and Parrhasius. The rather vague remark of a Roman writer, that they both lived "about the time of the Peloponnesian War" (431-404 B.C.) is as definite a statement as can safely be made about their date. Parrhasius was born at Ephesus, Zeuxis at some one or other of the numerous cities named Heraclea. Both traveled freely from place to place, after the usual fashion of Greek artists, and both naturally made their home for a time in Athens. Zeuxis availed himself of the innovation of Apollodorus and probably carried it farther. Indeed, he is credited by one Roman writer with being the founder of the new method. The strength of Parrhasius is said to have lain in subtlety of line, which would suggest that with him, as with Polygnotus, painting was essentially outline drawing. Yet he too can hardly have remained unaffected by the new chiaroscuro." Egg tempera is a radiant, semi-translucent paint that dries almost immediately. The process of setting up the paint was time consuming and technical. The artist used 1 egg, 1 tsp. raw olive oil, a few drops if vinegar added to ground pigment. The process to make just one color took about 30 minutes. Brushes were made from squirrel hair, hogs bristle and cat whiskers. Many of the pigments were extremely toxic causing the person mixing them to have oozing sores that never healed, patches of baldness, fingernails that fell off and in a few short years a painful ugly death. Old slaves were usually employed to grind up the pigments and mix up the binders. The Romans like the Greeks loved beauty and art. Upper income people had every wall of their home decorated with beautiful murals. Romans favored nature scenes with birds in flight, fish, dogs and exotic animals. Mythological scenes and philosophers in contemplation were also popular. Soc, According to noted historian, Hendrik van Loon "The Romans, like their Carthaginian rivals, were too busy administering other people and making money to have much love for “useless and unprofitable” adventures of the spirit. They conquered the world and built roads and bridges but they borrowed their art wholesale from the Greeks. They invented certain practical forms of architecture which answered the demands of their day and age. But their statues and their histories and their mosaics and their poems were mere Latin imitations of Greek originals. Without that vague and hard-to- define something which the world calls “personality,” there can be no art and the Roman world distrusted that particular sort of personality. The Empire needed efficient soldiers and tradesmen. The business of writing poetry or making pictures was left to foreigners."